The SafeZone app is available free for all students and staff, and operates across all University of Tasmania campuses and facilities. 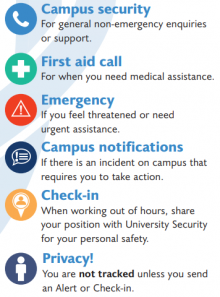 SafeZone is an app for your mobile device that allows you to quickly and easily request assistance and contact from campus Security. To download the app, please go to www.safezoneapp.com and follow the simple instructions for your device. Once you have downloaded the app, you MUST sign up for University of Tasmania campuses. Once you are signed up, if you make a call or send an alarm, it will be received by the University’s safety and security team. They will know your location and act on your request.